Saturday night was a glorious moment for D.C. United two decades in the making. The debut of its new home stadium — which oftentimes seemed like it would never get built, with years of false starts and busted deals — was in many ways a smashing success. Audi Field is a nifty 20,000-seat soccer home nestled amid the mushrooming condo towers and burgeoning bar and restaurant scene of D.C.’s waterfront. People were lined up to get into the sold-out stadium two hours before kickoff. There’s a partial roof, steeply pitched stands, state-of-the-art video screen and overwhelmed pupusa vendors— all but the latter of which were missing from D.C. United’s home for the prior two decades, decrepit, raccoon-infested RFK Stadium. Even from my seats — high above the pitch, almost in a corner of the stadium — the views of the match were superb. The debut on the field was equally auspicious. Yamil Asad christened the field with a glorious long-range strike inside of 30 minutes. Paul Arriola put the game away with a gritty, glorious second half brace. And the team’s marquee signing — Wayne Rooney, England and Manchester United’s all-time leading scorer — put in a promising 35-minute shift in his first match. 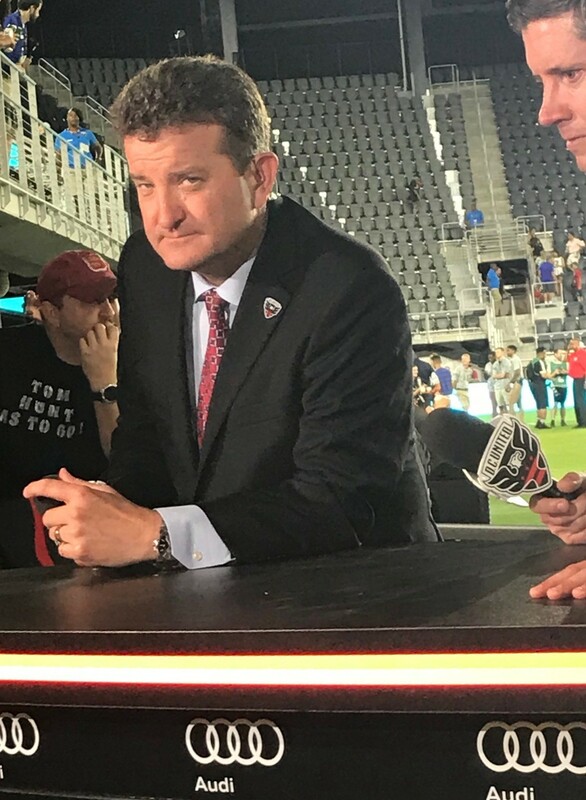 But so much about this massive moment in D.C. United’s history left me deflated, and it comes down to a single reason: The atmosphere in the stadium sucked. There was zero energy in the stands. The place was a gilded morgue. At just a few moments — Asad’s gasp-inducing strike, Rooney’s entrance, Arriola’s exit — did the crowd show any life, and even then it felt like the rote rituals of fandom that could be experienced at pretty much any U.S. sporting event. What made going to games at RFK wonderful, despite the severe limitations — and health risks — of the facility, was the weird tribal energy of the place. Even at games where there were barely 10,000 fans in the stands, watching a distressingly mediocre side, there were moments of blissful pandemonium amid the pounding drums and bouncing stands. D.C. United games at RFK also felt far different from just about any other cultural event in the city. The crowd was diverse, sweaty, pierced, scantily clad, drunk — a bit unruly. Weird is the word I keep coming back to — as much as I’m resisting that description. I’m annoyed at places (e.g. Portland, Austin) that feel the need to proclaim to the world their enduring weirdness. It’s a sure sign that they’ve lost much of the essential element of depraved energy that created that weirdness in the first place. But there is so painfully little in D.C. these days that could possibly be described as weird. It’s increasingly a city identified by professionals who pay people to wait in lines at the latest prestige restaurant, million dollar condos sprouting from every spare patch of concrete, and stroller pushing, dog leash wielding parents staring vacantly into their smartphones on every street corner. I’m not decrying gentrification. That would be obnoxiously hypocritical. I am among the invading upper middle-class masses. In recent weeks I’ve dined at Etto and Chiko, sipped Spanish wine at Maxwell and bought a tailored suit that cost more than my monthly mortgage when I lived in St. Paul, Minnesota. So much about D.C. changed for the better in the 15 years that I was away before moving back to town in 2013 — less political corruption, lower crime rates, better schools. But some essential element of weirdness has been lost. Which brings me back to last night’s game at Audi Field. The new stadium was never going to be like RFK, where there were pretty much no rules: sit wherever the hell you pleased, jump up and down on the seats until they snapped, smoke whatever you’ve got on hand. But I was pleasantly surprised to learn that season tickets weren’t going through the roof with the stadium upgrade. I paid $480 for a season ticket — which works out to $30 per game. That’s pretty much what tickets cost at RFK, although there were always ways to get cheaper seats. So there wasn’t, on its face anyway, any reason that many of the RFK diehards wouldn’t be able to afford tickets in the new digs. So what the hell happened? It comes down to a dispute between D.C. United and the team’s most fervent supporters’ groups — Barra Brava and District Ultras. Basically, the team decided to designate an “official” supporters group, and opted to bestow that title upon the Screaming Eagles — the oldest (and whitest) of the team’s fan tribes. The significance of that is really one thing: control of tickets in the area of the stadium reserved for supporters. That decision — understandably — pissed off Barra Brava and District Ultras. The end result is that they’re essentially boycotting the new stadium. Even those that opted to attend last night apparently honored that boycott by remaining conspicuously quiet throughout the match. I’m not going to pretend to understand the intricacies of this dispute. I’ve undoubtedly simplified it to a degree that completely misses many of the decisions and insults and miscommunications that led to this standoff. If you want a better understanding, read this Washington Post piece by Ryan Bacic. Or check out the Twitter feeds of Barra Brava and District Ultras. The bottom line is that this is D.C. United’s mess — and they need to figure out a way to fix it. I don’t have a clue how they can do that. From my outside perch, I can see that there is a lot of long-festering toxicity that’s not going to be easy to overcome. But for the sake of the fans — and the city — D.C. United needs to get this right. Otherwise, the part of the equation that worked so well last night — packed stands, endless pupusa lines, even the few moments of electricity among the fans — won’t last. The front office has nine days until the next home match to make progress. Otherwise, the shortcomings of last night’s debut will only be magnified at a mid-week game without the hype of opening night. Before the start of the game last night, there was a young man with a microphone circling the field. He kept screaming at the fans to “make some noise,” to which most reacted with a collective shrug of the shoulders. The guy also kept trying to browbeat us into believing that we were part of an amazing moment in the team’s glorious history. This sad spectacle crystallized everything that went wrong last night. Make peace, D.C. United, with the loyal tribes that brought the noise to decrepit RFK for so many years. Then you won’t have to hire a carnival barker to yell at the rest of us.